Barn Wood Wall - By The Superhandyman! 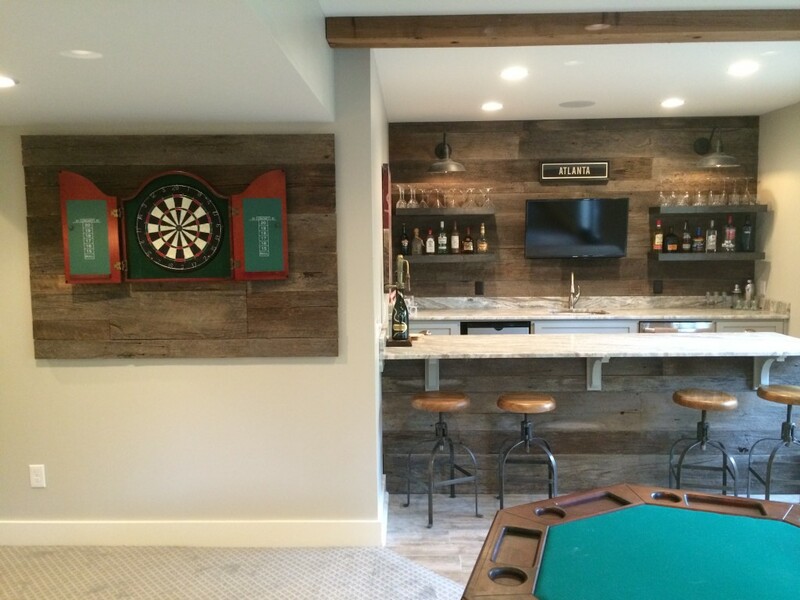 A very popular design trend today is the use of barn wood. It makes sense for more reasons than one would expect. Barn wood is visually stunning and responsible as it makes use of a reclaimed natural resource. It’s no secret our lives are more and more dependent on technology, updates, and speed, but we seem to have less time. In a mysterious way, barn wood added to a room is calming. It creates a nice grounding contrast to the technology that connects us. As you can see in the picture below, the barn wood I added to this room brings an air of old-world authenticity that is easy to fall in love with. It is old-fashioned but not dated. It stands out but doesn’t take over. If you are considering updates to a special room in your home, please contact me about this charming option. *Please be sure to see my other designs: Decorative Barn Door, Old Barn Wood Table, Breakfast Nook Booth, Triple Bunk Bed, Basement Bunk Bed, and Custom Loft Bed. Barn Wood on a wall in your home adds an old-fashioned authenticity and charm. In our world of tech, it is calming and grounding.